Get out and earn your Thanksgiving meal. 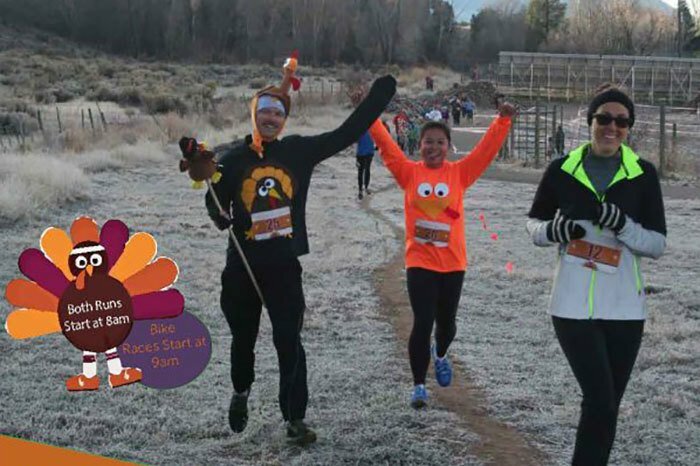 Join Carbondale Recreation and Aloha Mountain Cyclery Thanksgiving morning, Thursday, November 28 for a Huffin’ 4 Stuffin’ 5k, 1 Lap Fun Run, and/or Turkey Cross Bike Races on the same course at North Face Park. Runners and Bikers will race around a cyclo cross course specially designed for a great Thanksgiving race. It will be on grass and includes minor obstacles for all ages. All racers can enjoy a bonfire with pumpkin spice marshmallows, hot chocolate and apple cider, and post race snacks. Costumes are highly encouraged; the best overall running costumes will be rewarded. Prizes for first, last, and middle 5K races. Well behaved dogs on leashes are allowed – please pick up after them to keep this privilege.